Jim Toia makes his home in the hills of Northern New Jersey. He has spent years scouring the earth’s terrain for organic materials, from Taiwan to Tuscany, to make his art. Tapping processes nature employs to propagate and survive, Toia attempts to capture these acts and bring them to the viewer. Toia hunts for mushrooms and brings them back to his studio, where he creates an environment that allows the mushroom spore to settle on a specialized paper. The spores eject from mushroom gills and nestle into the textured surface, creating patterns untouched and impossible to create by hand. Jim is represented by the Kim Foster Gallery in Chelsea, NY. His work is the subject of a mid-career retrospective, From Here to Uncertainty, at the State Museum of New Jersey, Sept. 27 through January, 2016. He teaches at Lafayette College, is the Director of the Community Based Teaching Program and is Chairman of the Karl Stirner Arts Trail in Easton, PA. Shape Shifter, one of Toia’s mushroom spore drawings, was made in here in the Northeast using wild oyster mushrooms harvested from the region. Shape Shifter, 2015, 19″ x 26″. Framed in a 22″ x 30″. 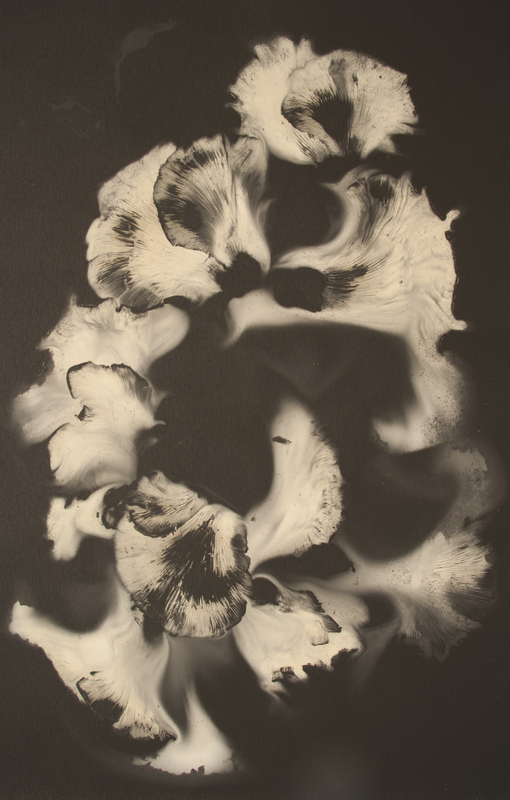 Oyster mushroom spore on Art Spectrum black paper.